This Limpopo safari lodge in Waterberg Area is a masterpiece of stone and glass. Marataba is tucked away in a private concession within a malaria-free national park which is home to Big Five game. Marataba offers exclusive wildlife viewing in beautiful surroundings characterised by mountain landscapes, valleys and grassy hillsides. 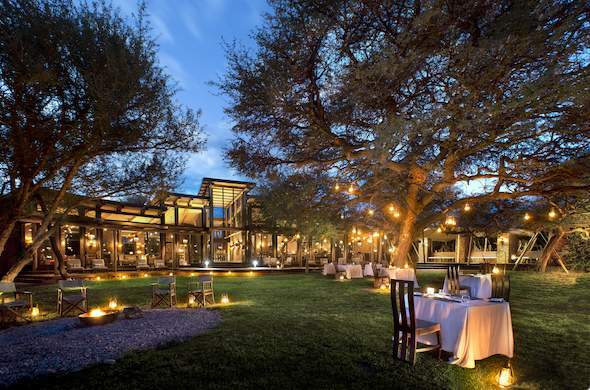 This Limpopo safari lodge in Waterberg Area offers excellent service and an unforgettable experience. In the Marataba concession you are assured of exclusivity on game drives. You can see plenty of big game such as Elephant, Buffalo, Rhino, Lion and even Leopard plus sought after Cheetah and Wild Dog in this region. Birding is also a highlight in the Waterberg Biosphere - a UNESCO reserve. At Marataba your mornings begin with a wake-up call and tea or coffee delivered to your tented suite, this is followed by a splendid breakfast and game viewing activities. Later in the day you can enjoy lunch and relaxation time in the library, which is located in a stone tower with great views. In the afternoons you could find a spot next to the fireplace in winter, and in summer choose to laze in a hammock or on a pool lounger in preparation for high tea. Cocktails are served in the Ladies Bar and fine dining can be enjoyed indoors or outside on the decks and in the gardens.